© Hughes et al. ; Licensee Bentham Open. Proximal humerus fractures are a common presentation to Orthopaedic services in the United Kingdom, and the incidence is increasing. Proximal humerus fractures are usually associated with low energy trauma in elderly patients. There is a sub-set of younger patients who suffer low energy fractures due to underlying osteopenia, commonly associated with alcohol excess. Skin puckering or dimpling has been described as a very rare complication of proximal humerus fracture. Based on the few previously published reports of this complication, skin entrapment in proximal humerus fracture is usually predictive of failure of closed reduction, and need for open surgery. Literature searches were carried out for relevant keywords. Articles were then critically appraised before being included in the literature review. The Authors were only able to identify three previous reports of this rare complication. The authors describe a rare case of skin interposition in an un-displaced proximal humerus fracture, outline a technique for closed reduction, and review the current literature surrounding this rare complication. Keywords: Buttonhole, complication, fracture, humerus, puckering, skin. Proximal humerus fractures are a very common presentation to Orthopaedic services in the United Kingdom. The incidence is rising, probably due to the association of these fractures with osteoporosis in an ageing population. Proximal humerus fractures are usually associated with low energy trauma, such as a fall from standing height, in elderly patients. There is a sub-set of younger patients who suffer low energy fractures due to underlying osteopenia, commonly associated with alcohol excess. Skin puckering or dimpling has been described as a very rare complication of proximal humerus fracture. Based on the few previously published reports of this complication, skin entrapment in proximal humerus fracture is usually predictive of failure of closed reduction, and need for open surgery. The authors could only find three previous cases in the United Kingdom [1-3], and only one case that underwent successful closed reduction. This case went on to have open reduction and internal fixation of the underlying fracture . The authors describe a rare case of skin interposition in an un-displaced proximal humerus fracture, and review the current literature surrounding this rare complication. Our patient was a 58 year old man with a background of heavy smoking and alcohol excess, who presented to our local emergency department complaining of left arm pain following a fall out of a ground floor window the previous night. 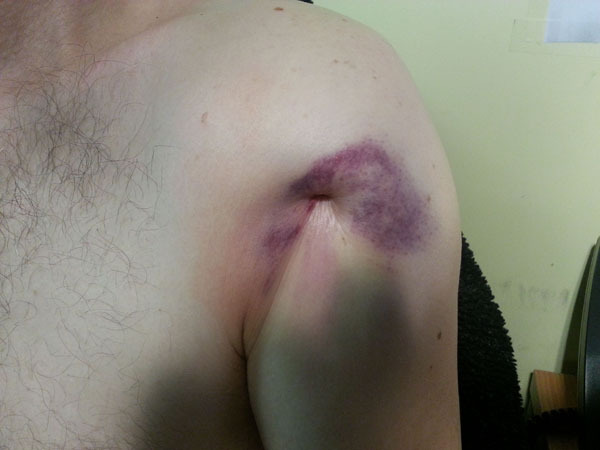 On arrival he was examined by the emergency department registrar and found to have a tender left shoulder, with bizarre skin puckering overlying his proximal humerus anteriorly (Fig. 1). The skin lesion measured approximately 2cm in diameter and was very tender to palpation. The patient was unable to move his left shoulder due to pain. Clinical photograph showing extent of skin puckering at first presentation to the Emergency Department. He was noted to have intact motor and sensory function of his Axillary, Radial, Median and Ulnar nerves. Initial radiographs were performed which demonstrated a minimally displaced transverse fracture through the surgical neck of the left humerus (Fig. 2). 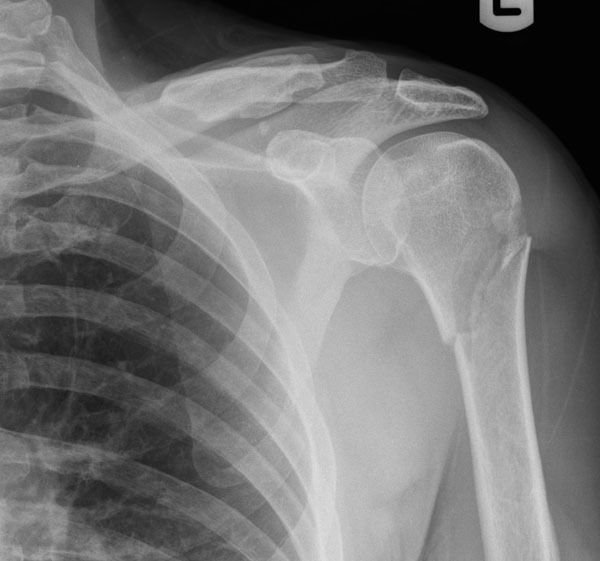 Radiograph showing minimally displaced fracture through the surgical neck of the left Humerus. The attending emergency department registrar then attempted to reduce the skin defect but various attempts were unsuccessful, which prompted referral to the on-call orthopaedic team. The skin defect was examined by the authors and thought to be entrapped skin ‘button-holed’ into the fracture site. This was very unusual given the minimally displaced nature of the fracture. The patient was taken to theatre emergently and the fracture was manipulated under general anaesthesia. The fracture was distracted with manual in-line traction and counter-traction with slight external rotation. The incarcerated skin was freed with difficulty by applying lateral traction to the skin whilst simultaneously sweeping a finger under the defect. This allowed the underlying fascia to be unhitched from the fracture site. The skin was released without causing any further trauma. The skin appeared viable despite being incarcerated for over twelve hours (Fig. 3). The fracture was then reduced by releasing the traction and reversing the external rotation. Satisfactory check radiographs were obtained. Intra-operative clinical photograph immediately post-reduction showing the extent of the skin entrapment, despite this the skin appeared viable. The patient was placed into a collar and cuff sling and allowed home, he attended his next two fracture clinic follow-up appointments where serial radiographs demonstrated no displacement and satisfactory healing (Fig. 4). The patient unfortunately did not attend any further appointments despite invitation, and was lost to follow up. The authors assume that the patient’s fracture healed satisfactorily and he returned to baseline function because he declined any further follow up. The authors obtained formal informed written consent from the patient to publish this report including the use of clinical photographs and imaging. Radiograph from follow-up fracture clinic appointment showing no loss of reduction. Soft tissue interposition in fracture sites has been well documented in the literature. Certain fracture patterns commonly have complications with soft tissue interposition, for example, distal humerus fractures. Skin incarceration in proximal humerus fractures has been reported only very rarely. The authors were able to find only three previous case reports [1-2, 4], and one study  where 2 out of over 7000 patients had tethering of their skin, documenting this complication. The authors were surprised that this complication was so rare given that the incidence of proximal humerus fractures is high, and it is a common presentation to our fracture clinics. The authors’ hypothesise that as the humerus was extended during the injury, the fracture displaced and loose skin was interposed in a plane through deltoid and between the heads of biceps brachii, giving rise to the strange appearance of skin entrapment without radiological fracture displacement. The previous reports differ markedly from our experience as they all required open reduction and internal fixation with the exception of one case. Aneja et al., reported successful closed reduction under conscious sedation, however the proximal humerus fracture they described was significantly more displaced than the case presented above . As a general rule, increasing degrees of displacement of a fracture increases the likelihood of complication. The case the authors present is extremely unusual because of the minimal displacement of the fracture. The case presented is also very unusual in that the skin was viable despite being incarcerated for over twelve hours. Aneja et al., commented in their report that early recognition and reduction is important to prevent soft tissue complications such as skin necrosis and subsequent conversion to open fracture . In our case the skin was viable despite more than twelve hours of incarceration, one explanation for this could be that the displacing bone fragment had caught the underlying superficial fascia and tethered the skin in situ. Despite our experience in this case, the authors agree with Aneja et al., in recommending emergent release of the soft tissues. Skin interposition is an extremely rare complication of proximal humerus fracture and, based on previously published reports, usually predictive of failure of closed reduction and subsequent need for open surgery. 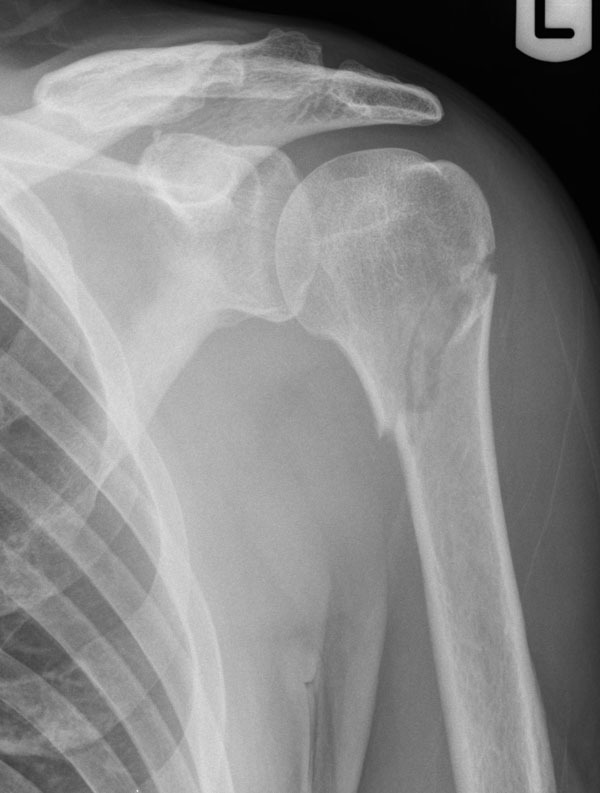 The authors report a case of skin interposition in an un-displaced proximal humerus fracture; and outline a technique for treating this complication successfully with closed reduction. Alshryda SJ, Odak S, Patel AD. Skin puckering as a sign of humeral neck fracture. Ann R Coll Surg Engl 2008; 90(8): 692-3. Davarinos N, Ellanti P, Khan Bhambro KS, Keogh P. Skin puckering an uncommon sign of underlying humeral neck fracture: a case report. Ir J Med Sci 2011; 180(3): 731-3. Robinson CM, Stone OD, Murray IR. Proximal humeral fractures due to blunt trauma producing skin compromise. J Bone Joint Surg Br 2011; 93(12): 1632-7. Aneja A, Jew NB, Graves ML, McKenzie K. Skin dimpling after a closed proximal humerus fracture. J Emerg Med 2013; 45(4): e99-102.